With the attention of the racing world certain to be on Santa Anita Park’s reopening this Friday, trainer Peter Eurton’s venerable California-bred 8-year-old gelding Ashleyluvssugar will be seeking his sixth graded stakes victory in the day’s main event, the Grade 2, $200,000 San Luis Rey Stakes at 1 ½ miles on turf. Second in his only start this year, the Unusual Heat Turf Classic versus state-breds at 1 1/8 miles on Jan. 26, Ashleyluvssugar, who won the San Luis Rey in 2015, will be facing stiff competition. 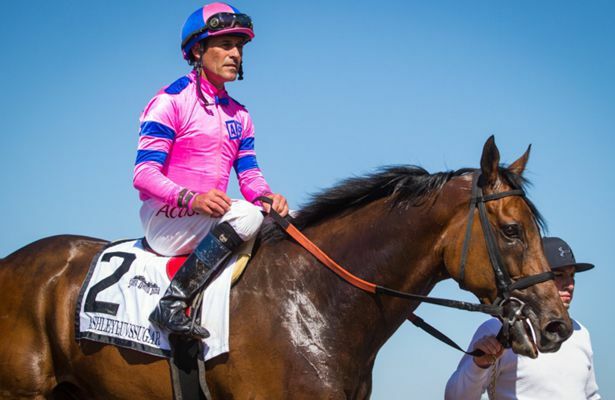 Second, beaten 2 ¼ lengths as the 5-2 favorite in the Sunshine Millions Turf Classic Jan. 26, this rugged California-bred gelding by Game Plan, out of the Urgent Request mare Ashley’s Folly, has two wins from five lifetime starts at the marathon mile and one half on turf. His connections are hoping he can improve on Friday in his second start of the year. Winless in his last nine starts, Kent Desormeaux will try his hand for the very first time as “Ashley” makes his 32nd career start. Although he won the 2015 San LuisRey from far off the early pace, he’s proven effective when laying close or on the early lead as well. With an overall mark of 31: 10-6-4, Ashleyluvssugar has earnings of $1,431,039. Most recently third, beaten one length in the Grade 2 San Marcos Stakes at 1 ¼ miles on turf Feb. 9, this lightly raced 6-year-old full horse by Giant’s Causeway rallied boldly from far off the early pace that day and would appreciate a fast pace as he bids for his second graded stakes win in what will be his 14th career start. With one win from two tries at the San Luis Rey distance, Beach View has come to hand for Powell and has finished well in all of his recent turf starts. Although it was run on dirt, he was a three-quarter length winner of the Grade 3 Cougar II Handicap at 1 ½ miles four starts back on July 25 at Del Mar. Second, beaten three quarters of a length in the Grade 2 San Marcos here on Feb. 9, this 4-year-old Uncle Mo gelding finished a neck in front of Beach View while earning a 96 Beyer Speed figure for the third consecutive time. A front-running winner of two consecutive turf allowances, on Nov. 15, going 1 3/8 miles at Del Mar and on Dec. 28, at 1 1/8 miles here, Epical was seventh in a field of 13 after the first quarter mile in the San Marcos and rallied well for the place. With Tyler Baze up for the fifth consecutive time, look for Epical to be forwardly place on Friday as he seeks his first graded win while trying the marathon mile and one half for the first time. Claimed six starts back for $50,000, this 4-year-old Bodemeister gelding comes off what appears to be his best career race, as he rallied from off the pace to register a half length win in a one-mile turf allowance here on Feb. 17. With class and the marathon distance looming as question marks heading into Friday, Risky Proposition, who counts a restricted stakes win at one mile on turf among his four victories from 11 starts, will hope to be a “live proposition” at an enticing price with Drayden Van Dyke up for the first time. A non-threatening seventh in the Feb. 9 San Marcos Stakes, this 6-year-old Temple City gelding ran perhaps the best race of his career two starts back as he rallied from far back to take a 1 3/8-mile turf allowance by a half length, earning a career-best 95 Beyer Speed figure. A winner of three of his eight starts in what was his best year on the track last year, Unapologetic will be ridden back by Geovanni Franco in his second start of 2019. With an overall mark of 28: 6-5-2, he has earnings of $253,176. Although a well-beaten 10th as the 5-2 second choice in the Unusual Heat Turf Classic Jan. 26, this 5-year-old full California-bred horse by Tribal Rule was a close fourth two starts back in the Grade 2 Hollywood Turf Cup at 1 ½ miles on turf Nov. 23 at Del Mar. Attentive to the pace three starts back, he posted a sharp one-length win in a 1 ¼-mile turf allowance here on Oct. 26. A California-bred stakes winner here at age 3, Marckie’s Water has three wins from eight tries over the course. With four wins from 15 overall starts, he has earnings of $264,963 as he seeks his first graded stakes victory.